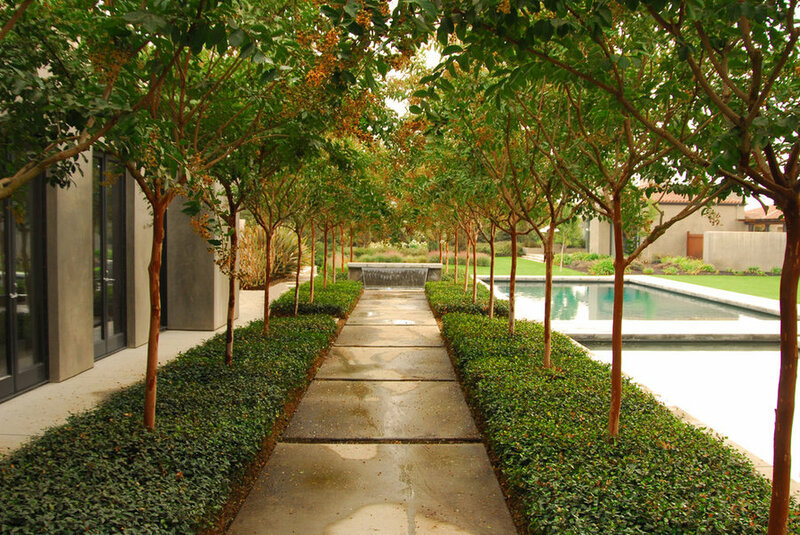 The Crape Myrtle alle continues from the front entry into the back yard space creating a strong connection between the front and the back landscape. 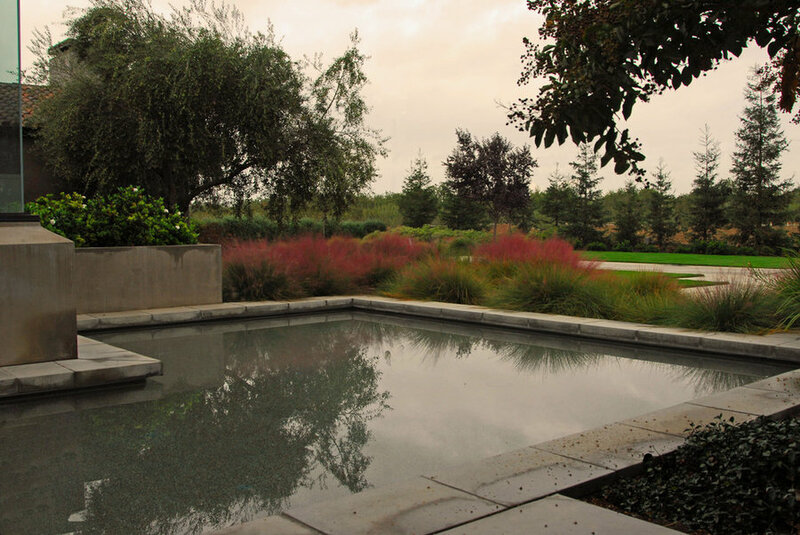 This also creates a strong visual line to draw the eye out into the landscape. 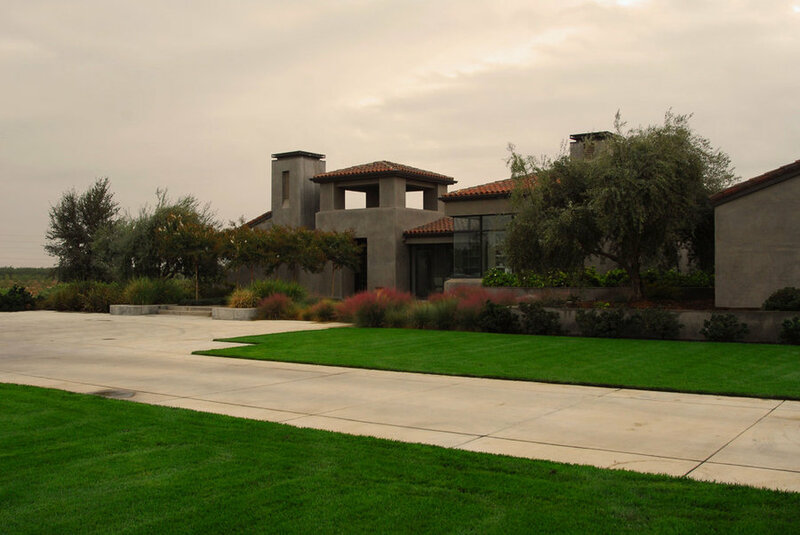 A traditional mediterranean with a contemporary mix was the theme for this residence. 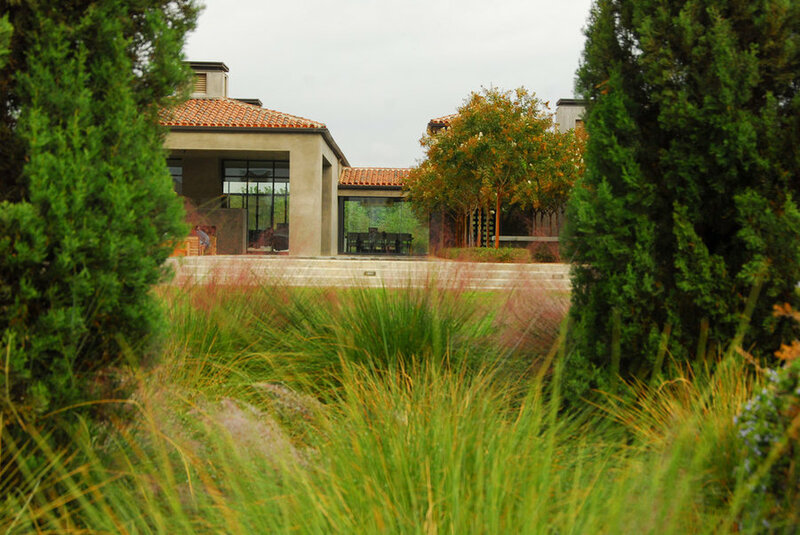 The landscape incorporates traditional plant materials, Olive, Italian Cypress, Crape Myrtle, Ornamental Grasses, and Rosemary but with a more contemporary mass planting pattern. 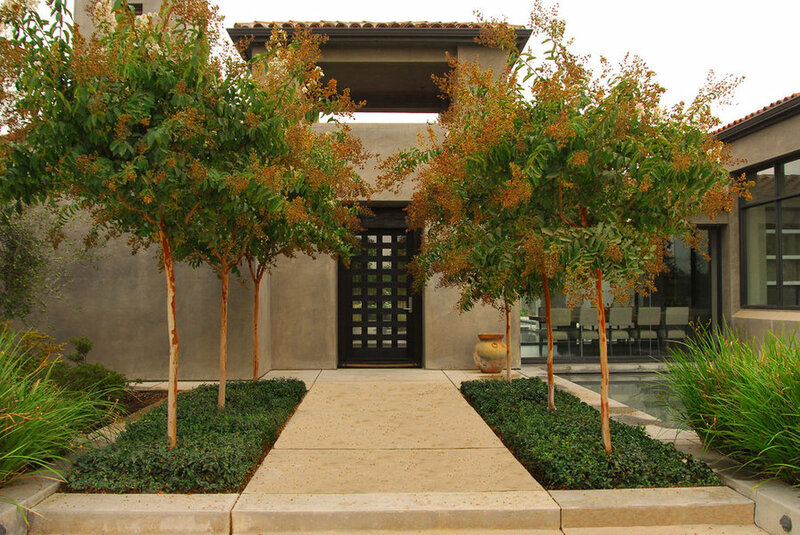 The front entry and porch with a crape myrtle alle begins in the front yard and continues on the other side of the entry in the backyard. 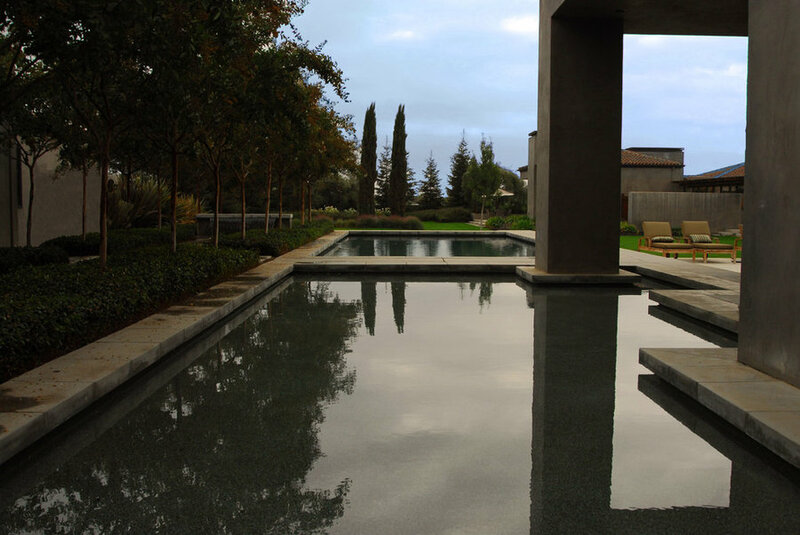 A reflecting pool to the right of the front entry also continues through the house into the back yard with a "glass bridge" over the water. 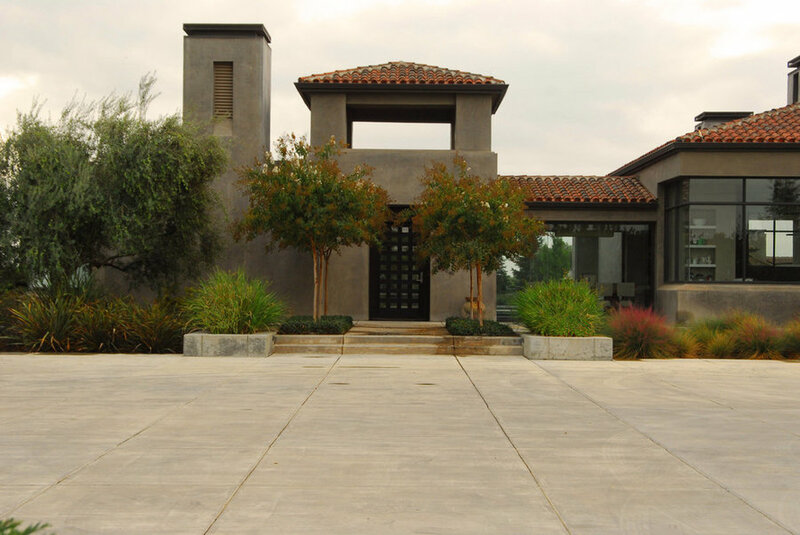 The front entry and porch with a crape myrtle alle. 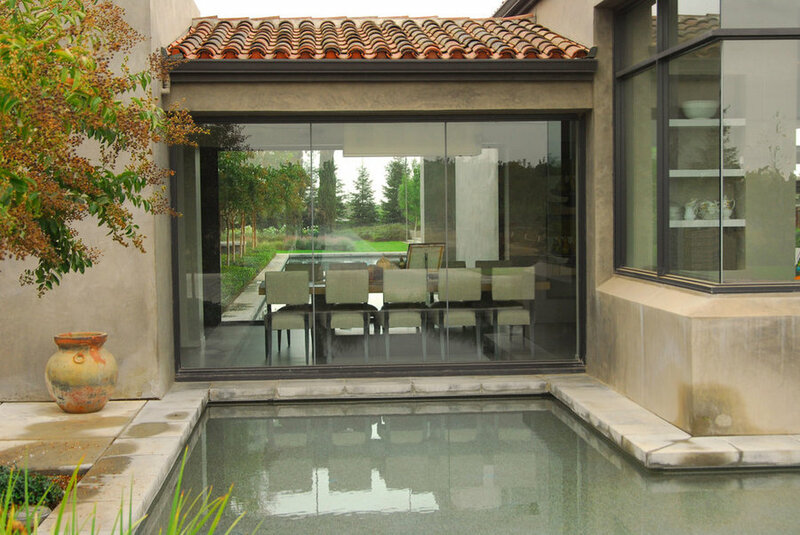 A reflecting pool to the right of the front entry continues through the house into the back yard with a "glass bridge" over the water. The Crape Myrtle alle continues from the front entry into the back yard space creating a strong connection between the front and the back landscape. 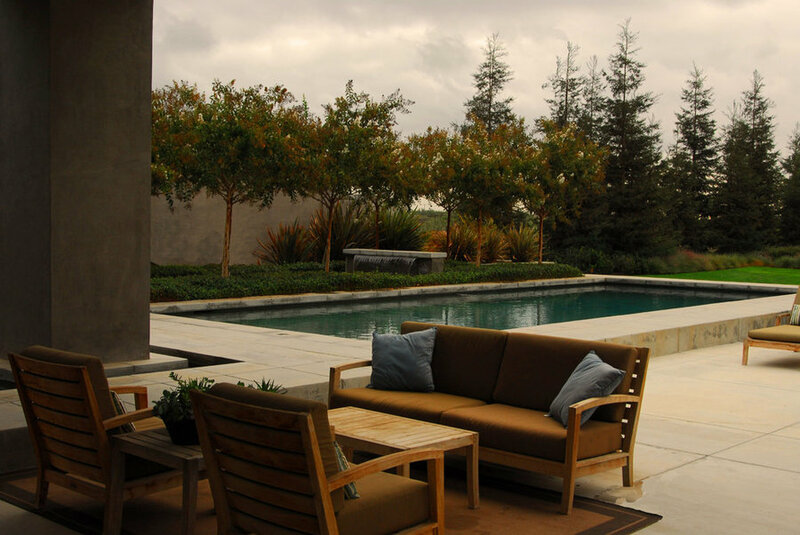 This creates a strong visual line to draw the eye out into the landscape. The strong linear line of the reflecting pool also continues from the front into the back yard space. 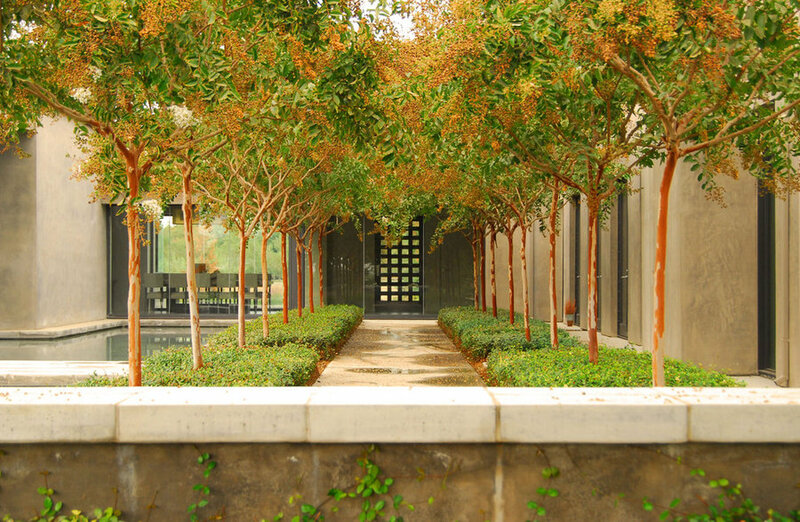 The Crape Myrtle alle continues from the front entry into the back yard space creating a strong connection between the front and the back landscape. 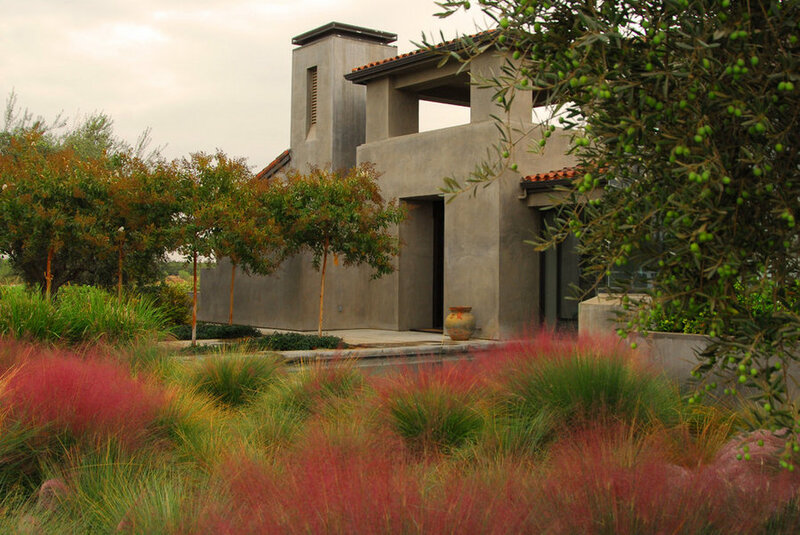 This creates a strong visual line to draw the eye out into the landscape. The strong linear line of the reflecting pool also continues from the front into the back yard space. 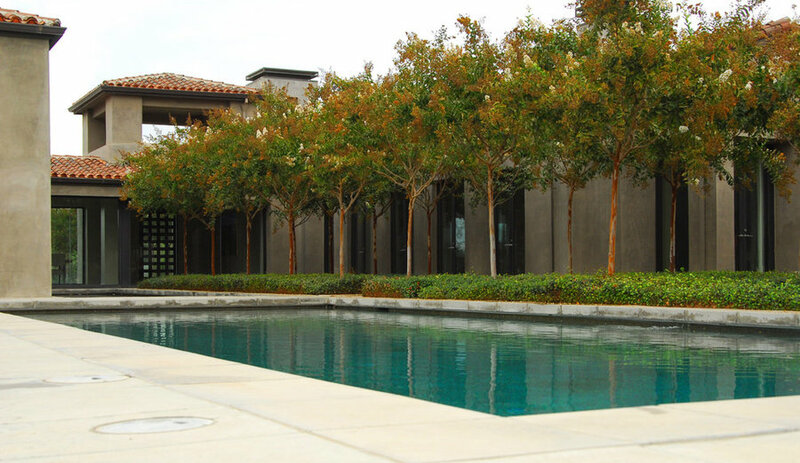 The end of the pool is elevated above the rest of the yard creating a sunken lawn area. 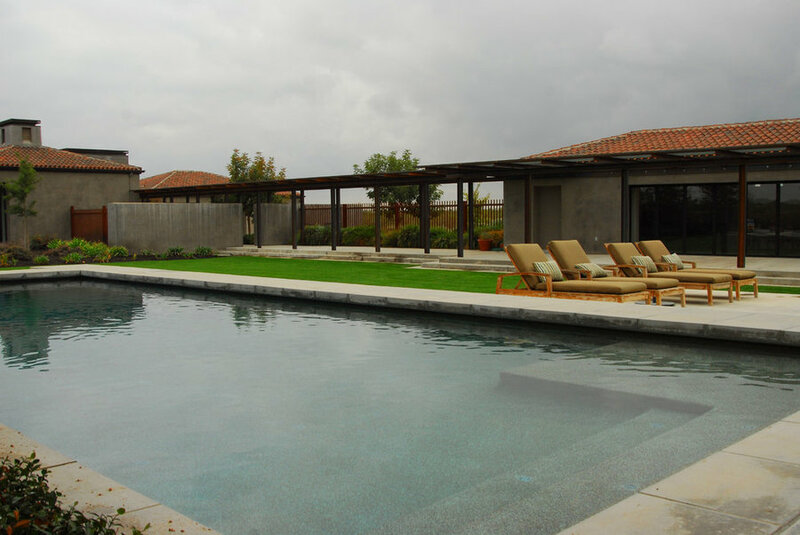 The linear swimming pool connects to the reflecting pool with a dividing bridge which provides access to the Crape Myrtle alle beyond and the bedroom wing of the residence. 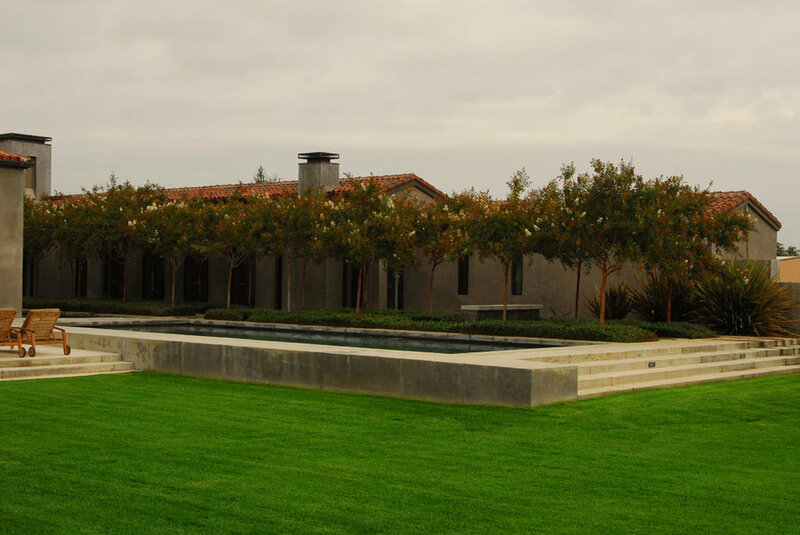 A view framed by Italian Cypress looks back toward the residence from the garden. 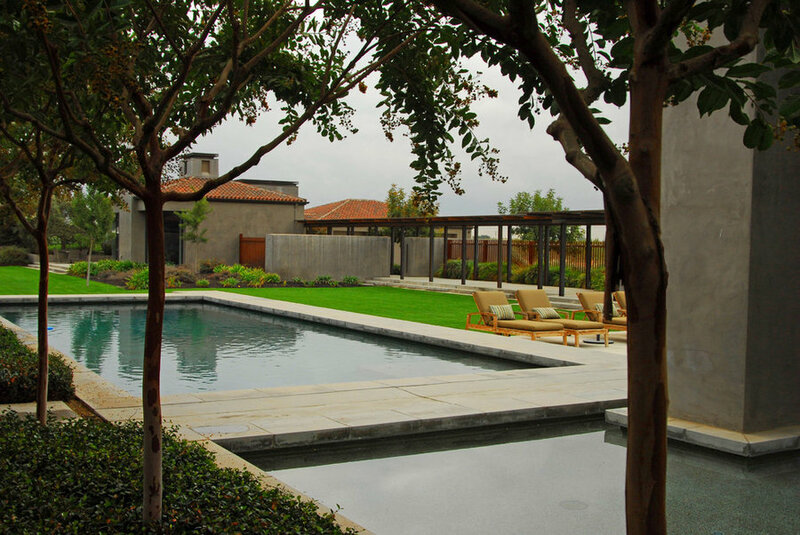 The pool terrace is slightly lower than the pool mid-way between the sunken lawn and the pool. 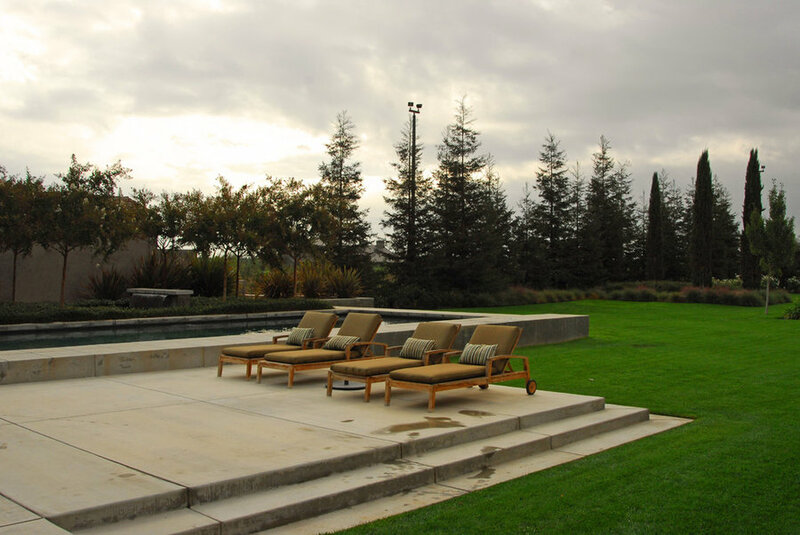 Continuous steps create a strong architectural pattern in the landscape. A view from the end of the pool tereace looks over the sunken garden. 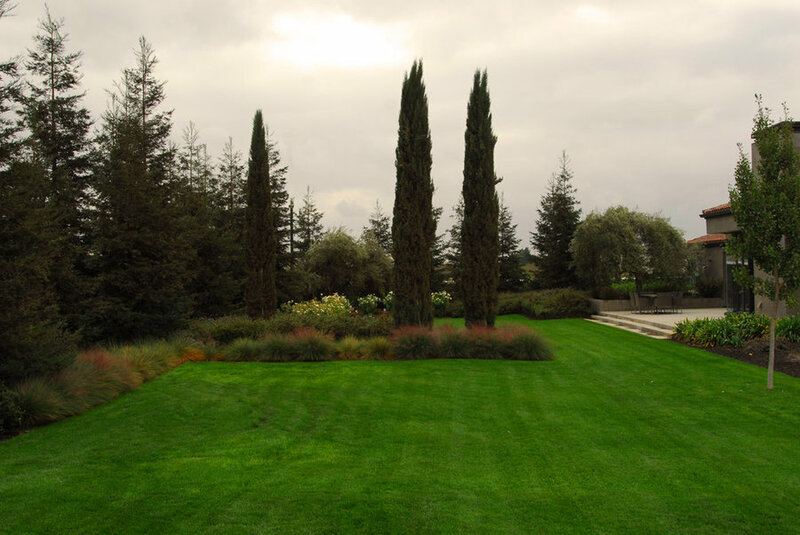 Italian Cypress in the distance divide the garden into different outdoor rooms. The perimeter Redwood Trees help define the space and provide a wind break. 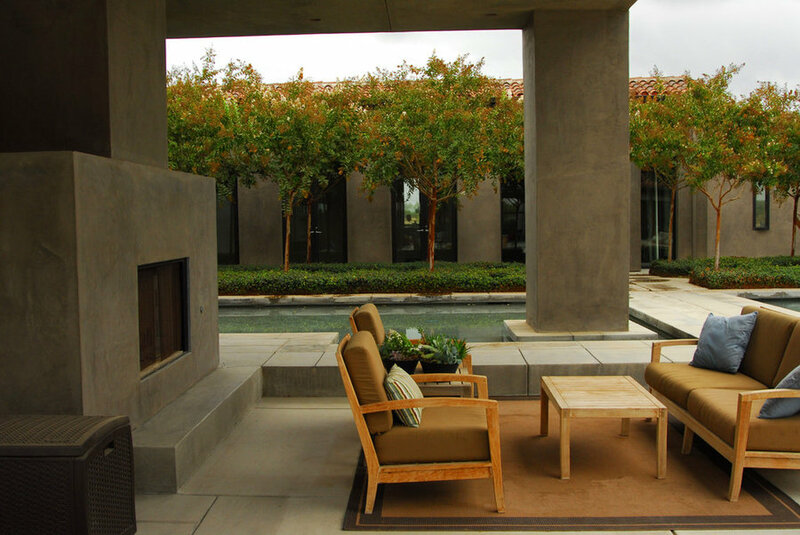 A covered outdoor living room with a fireplace overlooks the reflecting pool. The swimming pool continues at the far end of the reflecting pool.